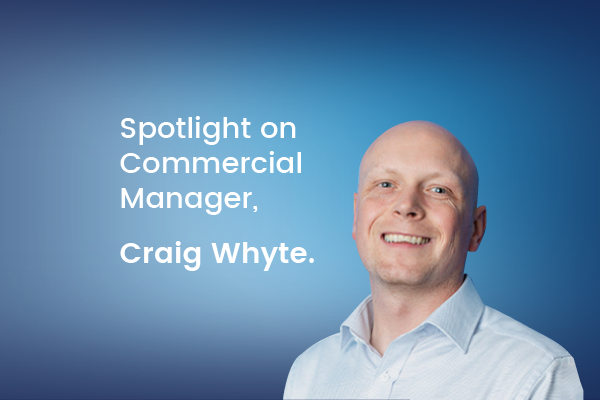 Craig Whyte is Commercial Manager at The JR Group, with over 20 years experience across both main contracting and private practice. Q.1: Tell us Craig, what is a typical day like as Commercial Manager at The JR Group? My typical day starts in the office at around 7am clearing any unanswered emails from the day or evening before, usually whilst drinking a hot cup of coffee. After this my day can take many forms ranging from reviewing contract conditions on upcoming projects, through to remeasuring works on site. Q.2: Tell us a little bit about your background in the Industry. I started out in the Construction Industry almost 20 years ago as a Trainee Quantity Surveyor for a small Private Practice based in Paisley, this company gave me a great grounding in traditional surveying. After obtaining my degree I moved into Main Contracting acting as Project QS on multiple new-build and refurbishment housing projects. It was after some 5 years in Main Contracting, undertaking predominantly housing projects that I decided to focus my career on Commercial developments. My first venture in the Commercial sector was as Senior Quantity Surveyor on the Maxim Office Park development at Eurocentral, on completion of this project I was given the opportunity to work in Africa as Project Controls Manager on a £300m new-build Hotel and Country Club project. On my return from working abroad I worked on the St Vincent Plaza office project in Glasgow City Centre as well as a number of other commercial projects before undertaking the Managing Surveyor role on a £45m new-build joint school campus in Kilmarnock. Q.4. What is the largest project that you have worked on at The JR Group? The largest project that I have worked on at The JR Group is our development at Law Place, East Kilbride which has just recently commenced. Law Place consists of 105 new-build houses and flats with a contract value of circa £12m. Q.5: What projects are you currently working on? Olympia Street in Bridgeton. This consists of 68 new-build flats. Hillhouse Road in Hamilton. Which is 29 new-build supported living flats and common-room. Another one we are currently working on is Carrongrove over in Denny. Interestingly this is the conversion of a Grade B listed building to form new houses and flats. As I touched on, we have also recently started works on 105 new-build houses and flats at Law Place in East Kilbride. I am also continuing work on a number of other developments, currently at pre-contract stage which are due to commence early 2019. Q.6: What skills or personal qualities do you need to be a good Commercial Manager? Strong client relationships are the foundation of my success to date. In my role as Commercial Manager, I regularly utilise my communication and interpersonal skills. To be a good Commercial Manager within the construction industry it is essential to be an effective communicator. It is important that a Commercial Manager can converse easily and is able to relate to all immediate and wider team members, ensuring success. It is helpful for a Commercial Manager to be comfortable and competent dealing with figures, as well as possessing strong analytical skills. Combining these skills with a flair for problem solving and attention to detail help to create a good Commercial Manager. Q.7: If you could describe The JR Group’s core values in 3 words, what would these be? Q.8: What do you enjoy most about working with The JR Group? One of the most enjoyable aspects of working at The JR Group is that we all share a common objective in ensuring that the company is successful. The combined drive of the team to achieve success at The JR Group creates a positive and vibrant working environment.